The first thing you notice about Maxine McCormick is that she is cuter than a truckload of baby ducks. Then, right off, you can tell she is poised, clear and bright, and that her squirrel-like voice of youth might catch you by surprise. Then you realize, despite her world-renown feats, McCormick is only 12. Last week, she finished as the No. 1 female fly caster for accuracy at the U.S. Casting Championships in Kentucky. In one event, fly-casting trout accuracy, McCormick outscored legendary world champion Steve Rajeff, considered the greatest caster in history. 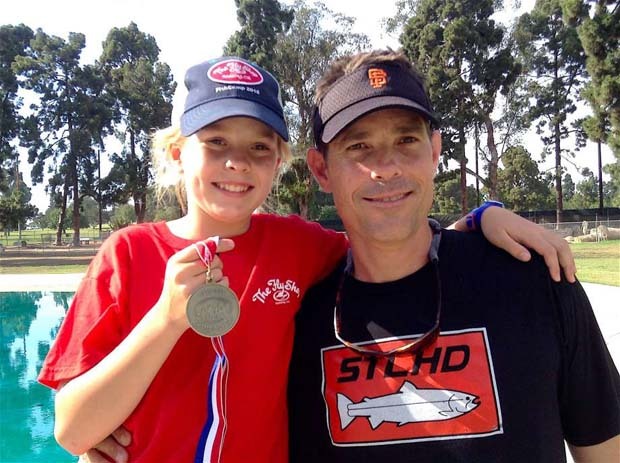 McCormick will join four other members of the San Francisco/Oakland Casting Club to compete in the world championships in mid-August in Estonia. She has a chance to become the youngest gold medal winner in the sport’s history. The youngest gold medal winner in the Olympics is believed to be 13-year-old American diver Marjorie Gestring in the 1936 Berlin Olympics. In competition, McCormick said, she tries to repeat the casting stroke she has refined in practice at the casting pools. “Maxine isn’t 1-in-a-million,” said her coach, Chris Korich, who is leading the U.S team to the world championships. “She is 1-in-7.4 billion,” the number of people on the planet. Anybody in America can try to qualify for the U.S. Casting Championships. The San Francisco/Oakland clubs (which between them have more than 1,000 members) have dominated the sport. After last week’s championships, all five spots for fly-casting accuracy on the All-America team were awarded to club members from San Francisco/Oakland: McCormick; her father, Glenn McCormick; Chris Korich; Henry Mittel; and Rajeff. In trout accuracy casting, contestants use a fly rod similar to what was used in the movie “A River Runs Through It.” In three rounds, they cast at five 30-inch rings, at distances from 20 to 50 feet. Each participant starts with 100 points, and a single point is deducted for every foot by which a target is missed. Participants can also lose points for “ticking the water” and other style points based on fishing skills. To put McCormick’s accomplishment in perspective, Rajeff — born and raised in San Francisco — has won 44 all-around titles since the age of 15. Considered the greatest caster in history, he was inducted into the California Outdoors Hall of Fame and has lost the national all-around title only once, to Korich in 1993. But McCormick clipped him in her specialty, trout accuracy. Read complete story here . . .
For information on the Golden Gate and Oakland Angling & Casting Clubs.